Two white kittens are cuddled up in the arms of a large teddy bear under the Christmas tree. 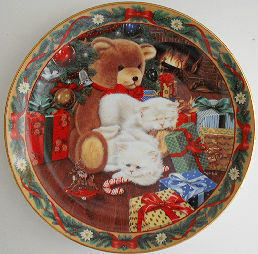 This collectible cat plate is part of Santa's Little Helpers collection by The Bradford Exchange, copyright 1994. The plate is 8" in diameter, gold rim. Previously owned but in good condition.